Joe loves the Pro Bowl vibe. Anything NFL warms Joe’s heart. Today at Disney World, Joe was able to score a little 1-on-1 time with Andrew Luck, a student and friend of new head coach Bucco Bruce Arians. JoeBucsFan.com: What should Jameis Winston expect with Bruce Arians walking in the door and coaching him up in the first six weeks? Andrew Luck: Not just Jameis, but every player, it’s honesty. He’s a good man; he has a good heart. He coaches hard. It may feel like he’s being hard on you, but as soon as you walk off the field, he’s your biggest fan. He’s a great guy. I learned so much from him. So thankful to have played under him and happy he’s got another opportunity. It’s great. Andrew Luck: No, I developed a tremendous amount under Bruce, learned a lot, still stay in touch with him very closely. And, yeah, he very much helped me in many ways. Joe also had a little off-the-record chat with Luck about what’s next for the Bucs. Joe’s confident the Tampa Bay culture change will be radical from the moment the remaining players return in six weeks. I love his first answer. First words are that it’s not just the QB it’s every player. So much better then our last HC who was hired for one player and who says he don’t meddle with his defense and when asked why his team failed has answered he didn’t know how to fix it. Most comical hire in franchise history. He was hired by the media, that’s why. Most comical hire in franchise history. hands down bad character lovie smith and the family plan was the most comical and damaging hire of all time. Joe, its damn awesome that you’re at the Pro Bowl delivering deep info from former Arians guys. What other publication does this? Seriously awesome to read Andrew Luck’s take on the status of the Bucs… Only at JBF baby. Very well done here, Joe. Luck is a class act and the NFL is better now that he’s healthy once again. @JimmyJack – I agree. This team needs much more than a head coach “quarterback whisperer.” It needs better head coaching across the board. I think the biggest challenge BA will have with changing the culture is wrangling in the TB media and fans, who as Koetter said are so desperate to win they babble on insanely about things they have no idea about. I agree with everyone else. Seriously great reporting. Feels like Joe is working undercover and getting some real stuff here. I think the looming roster moves are also going to tell a story. LOL Team Glazer never called Joe to ask for his pulse in potentially hiring Dirk Koetter. And like TMax said, the (dark) comedy hire was Lovie. This team is still trying to dig its way out of the hole he dug. And does that include Jameis ? In Joe’s mind that’s about the only thing Lovie got right. I 100% agree with Joe on this comment. That sounds more like Mark Dominik than anyone else I can think of in the last 10 years of Bucs history. You can change all the faces but the results have remained the same. The most losing franchise ever. I hope BA has success. Coaching Matters. I’d be curious to know how many first round picks are on the Patriots D right now. DB55- I know it goes against everything your body tells you is right, but you have to have Spam while there. Also, there are some nice longboard waves in Waikiki. Ride one for me, will ya?! It’s not where you pick, it’s who you pick and how you coach them. Dirk was a good offensive coordinator, but he wasn’t a good head coach. He coached scared, and during hard times acted more like a baby than a leader. I have no ill will towards him, he just wasn’t the right guy. Hoping BA is that guy. 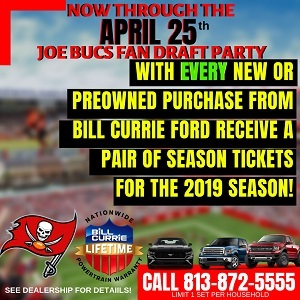 @DB55- bucsfanman soraks the truth. Try some spam musubi. It’s fantastic. After that, go eat at all the local fish markets. The best poke you’ll get anywhere. And the plate lunch. So damn good! Don’t do the touristy stuff man, eat where the locals go. Trust me. jmark- That’s why draft position is such a farce. When you can develop players, and WIN, the pick # doesn’t matter. It’s picking the RIGHT player that matters. unbelievable- Stole my thunder! ONE MILLION PERCENT agreed! Sorry, but can’t say that Lovie Smith was the franchise’s worst hire with Leeman Bennett’s name on the books. Lovie might also have been better than Ray Perkins and Richard Williamson. Culture change. How many times? Do it or STF up!!! The punch the best thing on the island 😂😂😂 besides the Tahitian women of course, goot lort! Went to Giovanni on the north shore. Overrated if you ask me, rainbow diner meh, chief luau at wet n wild and while the Luau dancers were outstanding to the tenth degree all the food needs salt lol. Hawaii where they don’t like salt but got sugar on lock. DB55- We’re living vicariously through you bro’! Donn’t disappoint. Agreed on the Luau dancers. My wife chin-checked me the last time we were down there! I got “mesmerized” by the movement! LOL! Hey Colts trade you Winston for Luck, straight up. No. OK will throw in Jackson.